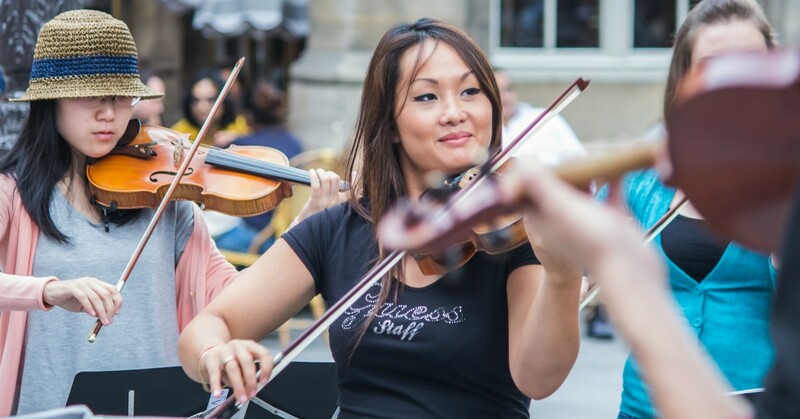 If you want to experience authentic Paris then the Le Marais neighbourhood is the place to go. Anchored on the Left Bank of the Seine and spreading across the 3rd and 4th arrondissements, the Marais has evolved from a largely working-class area to a trendy, upmarket and fashionable neighbourhood. On hot summer’s evenings, Parisians saunter down the cobblestone streets, stopping every so often to grab a vacant table outside a café and languidly sip on a glass of rosé or Kir Royal’s as the sun descends behind the historical buildings. Or huddled up in a corner booth in a cosy dimly-lit bar sipping on a glass of rich red wine and idly passing time during those long winter days. In any weather, Le Marais is a bustling hub of activity and vibrancy, attracting locals and in-the-know tourists who appreciate the finer things in life. Despite being a relatively small pocket of the sprawling city, the Marais packs a punch with a plethora of unique shops, interesting museums, delectable restaurants, street entertainment and boutique accommodation options. Undeniably, Paris is known for its exquisite culinary options. Fine dining, decadent desserts and fresh produce are some of the main reasons millions flock to the city, and the Marias has this in abundance. The Marche des Enfants Rouge (translated to The Market of the Red Children) is a mecca in the very heart of the Marais with rows of stalls selling organic fruit and vegetables, vendors offering traditional French fare, as well as an array of global cuisines. From Moroccan and Mediterranean to Japanese and vegan, visitors will be hard-pressed not to find a wonderful plate of food at a very reasonable price. A general rule of thumb in Paris is that if you see Parisian’s lining-up for something, join that line, as chances are whatever is at the end of it is worth waiting for. 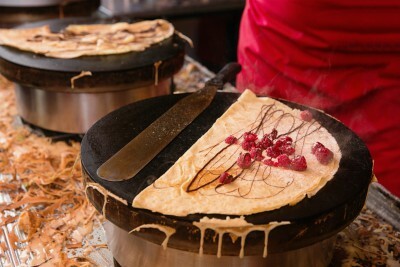 The crêpe stall in the Marche des Enfants Rouge is a good example of this principle, and you will not be disappointed. Le Marais also has a thriving Jewish community which is centred on the pedestrian street called Rue des Rosiers. Strolling along the length of the cobblestone street, you will undoubtedly be tempted by the divine pastry shops and absorbed by the cacophony of commotion. However, a great number of the street’s occupants have come to get hold of one particular piece de résistance – falafel wraps! 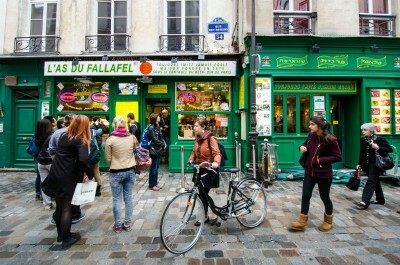 Again, the line theory comes into play for the falafel shop L’As du Falafel which perpetually has a cue outside its small green frontage for what has been described as the best falafel wraps in all of Paris. Praise for this vegetarian delight is insurmountable, and for good reason. Pita wraps stuffed to the brim with chunks of falafel, grilled eggplant, cabbage and a combination of hummus and tahini which drips ungraciously down the sides of your hand are handed out as fast as the friendly servers can assemble them. Crêpes have come to be synonymous with French cuisine. Whether savoury or sweet, served from a cart on the street curb or from a trendy café, a visit to Paris would not be complete without indulging this native delicacy. And one of the best places to nab a traditional Parisian crêpe is in a famous institution on the Rue Vielle du Temple in the heart of Le Marais. Breizh Café can be recognized by its dark blue façade and the bevy of locals and tourists who huddle on the footpath waiting for a table. The crêpes, made with buckwheat flour, can be ordered either sweet or savoury, ingredients ranging from ham, cheese and eggs to salted caramel and crème fraiche, meaning you could order crêpes for main course and dessert should you be tempted. And despite the ingredients being of top quality, the prices are reasonably modest. For a truly memorable fine-dining experience, head to Chez Julien on the Pont Louis-Philippe where the Marais meets the Seine. Chez Julien is a romantic quintessentially French restaurant with beautiful décor dating back to 1900 and a cosy atmosphere all bathed in dim candlelight and enveloped by the soft sounds of alluring French jazz music. Chez Julien is a favourite among the crème de la crème of Paris who appreciate that a proper rendezvous must include fine food and, even better, wine. Serving typical French fare, the chef tailors the menu to the seasons, using only the freshest produce. Truffles make a regular appearance along with dishes such as foie gras for entrée, veal tartare or steak served with rich sauce and wild sea bass for mains. In classic French fashion, the cheese plate is a popular choice for dessert as is the crème bruleé. And, of course, all dishes are thoughtfully paired with a local French wine, whether a fruity white from the Loire Valley or a deep red from Bordeaux. 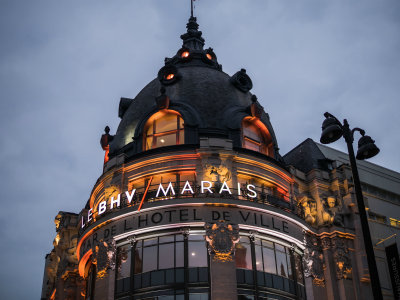 Le Marais is also an incredibly great shopping district and is a brilliant alternative from the madness which encompasses the Champs Élysées. 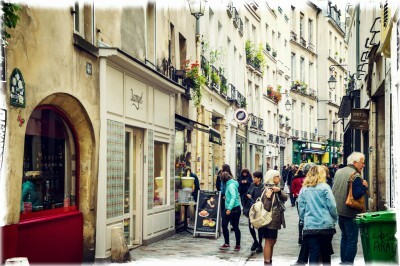 Parisians tend to venture to the Marais on Sundays for a spot of window-shopping as many of the avenues are closed off to vehicles and are reserved only for pedestrians and cyclists. However, on any given day, the covert shopping district is an ideal destination to purchase unique gifts and French wares. If antiques and vintage goods pique your interest, then the St Paul Village in Le Marais is the place to go. You can easily spend an entire day weaving through the narrow streets hunting for treasures, popping in and out of rickety shops which sell anything from furniture and toys to clothes and vinyl records. With over 80 antique dealers, art galleries and boutiques, treasure hunters are sure to discover a few gems. The village is centred round four quiet and shady courtyards where shoppers can recharge at one of the many quaint cafes and restaurants. A trick I learnt after my second visit to Paris was to only fill my suitcase up halfway as I inevitably purchase an excessive amount of unique French products, many of which can be sourced from shops in the Marais. Diptyque is a mecca for heavenly scented candles and perfumes, with masterfully created fragrances ranging from floral, woody and fruity scents. All of Diptyque’s products are made from natural elements and will have you dreaming about Paris as the aromas fill your home and conjure up blissful memories long after you return from the city. For elegant stationary and unique postcards, head to Mélodies Graphiques, an oasis for lovers of all things calligraphy. Old-fashioned pots of ink, beautifully created paper, hand-made cards and an array of writing instruments are displayed throughout the atelier. The one-of-a-kind store is a wonderful tribute to the dying art of the handwritten note and its wares are a perfect Parisian memento. Dammann Freres is a purveyor of fine teas and its shop in the Marias on the Place des Vogues is worth a visit. The exquisite boutique nestled in the arches of the opulent square is the perfect setting to display over 250 different varieties of tea. The scent from these intense flavours, including oolong, vanilla, cinnamon and even chocolate and berries, swirl overwhelmingly to create a truly blissful setting. Customers are freely able to open compartments, boxes and packages to sniff out their favourites and pick an ideal blend. 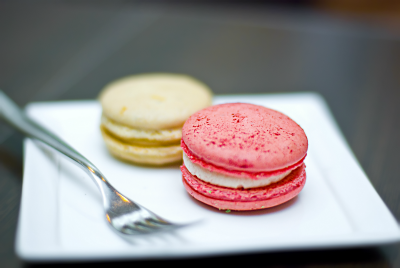 A sweet treat is usually the perfect accompaniment to a good cup of tea, and Pierre Hermé’s macaron’s are arguably the most celebrated pastries in Paris. Pierre Hermé is a legend in the French (and the world’s) pastry realm and his shop in the Marais can be found on Rue Sainte-Croix de la Bretonnerie. Much like the tea, these little morsels of heaven come in a variety of different flavours. However, the most popular are salted-butter caramel, hazelnut praline, and the classic Madagascan vanilla. Aside from treats and souvenirs, the Marais also has an abundance of high-end French fashion boutiques and is a brilliant spot to purchase the necessities in order to emulate the impeccably classic French style. Many of the boutique French labels are set along the Rue Vieille du Temple, Rue des Francs-Bourgeois and Rue de Turenne. Chanel, Le Kooples and Guerlain as well as Isabel Marant, John Galliano and Azzedine Alaïa can all be found along these avenue as well as a number of unique concept stores. Being one of the oldest neighbourhood’s in Paris, the Marais has a great deal of historical architecture, wonderful museums and remarkable buildings. Perhaps the most significant of its landmarks is the Hotel de Ville. Translated, it means the Town Hall and has stood at the same site since 1357, making it one of the most enduring buildings in the city. Since its creation, it has been rebuilt several times, the latest of which was in 1871 when it was destroyed by a fire and refashioned in the neoclassical style which stands today. The façade is truly extraordinary and the interior is just as lavish with grand halls, ornate staircases, high ceilings and intricate stain-glassed windows. It still houses the Mayor of Paris and local government authorities, which means access to the public is restricted, but even to stand in the middle of the square and gaze up at the magnificence of the edifice is breath-taking. Paris is not short of famous museums, and one of the lesser known yet equally interesting is the Museum Carnavalet in the heart of the Marais. Formally two mansions dating back to the Renaissance era, the museum is dedicated to the history of Paris. Within its 100 rooms, the museum showcases an array of art, antiques and historical artefacts which tell the story of the ‘City of Love’ throughout the ages. The gardens of the museum are also worth a visit and, like the museum itself, are completely free to access. As mentioned above, a section of the le Marais is also host to the Jewish Quarter and its rich history is deeply ingrained in the area. The Hector Guimard and the Tournelles Synagogues are both testaments to the dynamic population of Jews in the Marais. Although both are closed off to the general public, their unusual and magnificent architecture are a sight to behold. Additionally, the Museum of the Art and History of Judaism located on the Rue Hôtel de Saint-Aignan in the Marais offers a truly unique insight into the history, culture and art of the Jewish community in Paris. Housed in a 17th century mansion, the collection exhibits the unique heritage of Judaism through works of art and traditional historical pieces. One of the most peaceful and charming places to sit and indulge in the very Parisian trait of people watching is the Place des Vogues. Stumbling serendipitously upon the hidden little gem in the Marais off the Rue des Francs Bourgeois as it opens up to one of the oldest planned squares in Paris, this is the perfect spot from which to appreciate the everyday life of Parisians. The square is adorned on each of its four sides by rows of boutique shops and upmarket cafes under grand arches which, in the 17th century, were porticos to private townhouses for King Henri IV’s monarchs.